Sebastien Montaz has been filming the Skyliners and their Alpina watches on an incredible exploration into the world of free flight. Tancrède Melet, Julien Millot, Seb and Antoine are pioneers in ‘highlining’ – a vertiginous combination of climbing, slackline and tightrope walking. Tancrède Melet – born in 1983 in Meurthe-et-Moselle, Melet grew up in Hérault before becoming an engineer. He practiced engineering as a profession for four years before leaving in 2008 to indulge in sports alongside Julien Millot. The duet began with the slackline and more particularly an elevated version of the highline. After a few years, Melet engaged in the performing arts. He was the co-creator of the group Flying Frenchies that combines artists, sportsmen and engineers. On January 5, 2016, during the preparation of a show, he died as a result of a fall from a hot air balloon. Julien Millot – rock climbing is his first love, which quickly leads him to new adventures: alpinism, base jumping, paragliding. 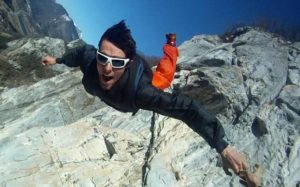 Being up in the mountains, suffering bad weather or carrying heavy backpacks will never take the smile off his face, he lives life to the fullest, especially when he wingsuits off a cliff. Dynamic and passionate, he organizes his projects to hit right in the target. Julien works also for slack.fr, a slackline equipment company. Montaz-Rosset Film is an award-winning producer of innovative and creative factual and commercial film, based in the the heart of the Alps – the adventure playground of Chamonix-Mont-Blanc. With a complete service from concept to distribution, Montaz-Rosset Film has everything covered down to the last detail. From finding the ideal location and the most talented athletes, through creating thought provoking visual narratives and commercial campaigns, to delivering solutions for social media and multi-lingual markets. Norway BASE Jumping Kjerag cliffs in Norway Tracking and Wingsuiting off the Kjerag cliffs in Norway. Jesse Hall, Kyle Sul, Suzanne Graham, Nick Kerezovich, and more.